Veeam Endpoint Backup for LabTech released! 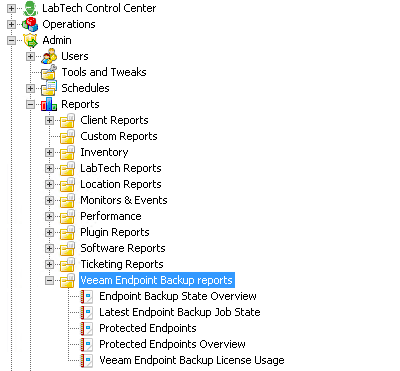 Veeam Endpoint Backup for LabTech goes GA! Veeam Endpoint Backup FREE, announced a few months ago, is still going strong and we have over 65000 downloads so far. Not long ago, we announced Windows 10 support with Veeam Endpoint Backup FREE 1.1 along with some additional new functionality. We already told you that we were working on integrating with LabTech to allow a lot of the most requested features become possible … centralized management, remote deployment and configuration, and reporting. 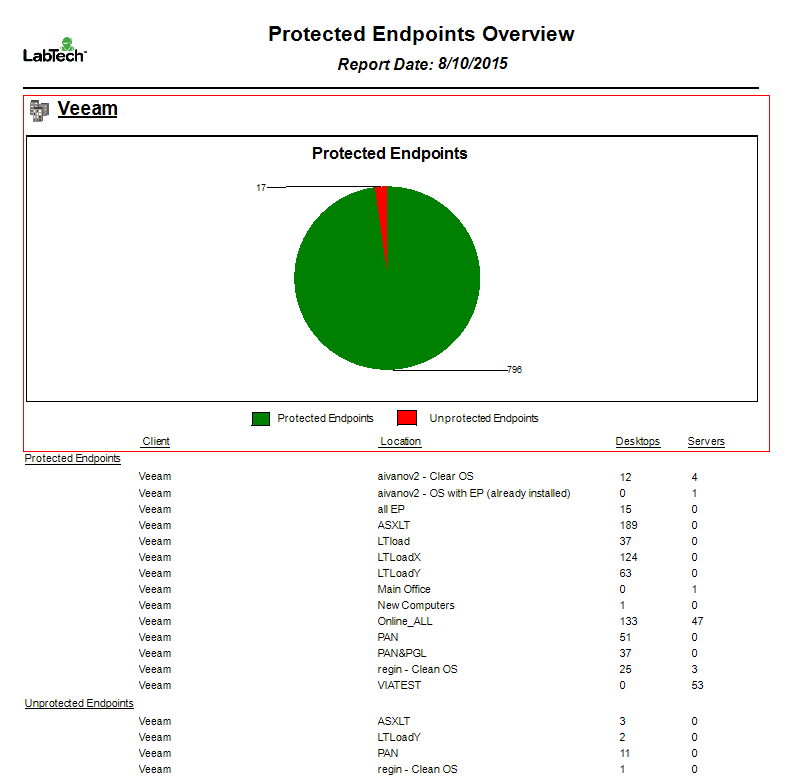 Today, we are proud to announce the general availability of Veeam Endpoint Backup for LabTech. 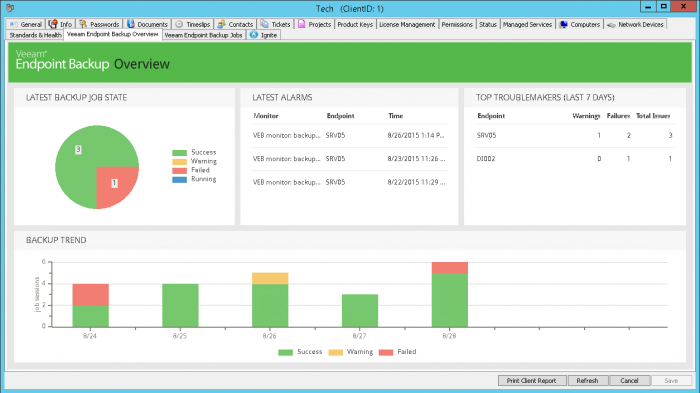 Veeam Endpoint Backup for LabTech, which is comprised of both Veeam Endpoint Backup and the Veeam Endpoint Backup plug-in for LabTech, brings centralized management, remote deployment, remote recoveries, monitoring and more for service providers using the LabTech remote monitoring and management (RMM) platform. All the functionality of Veeam Endpoint Backup for the customer, combined with centralized management for the service provider. Remote deployment, configuration of backup jobs, monitoring and management in the hands of the service provider. No need for a technician to visit each endpoint and configure them manually one by one. I don’t need to explain the functionality of Veeam Endpoint Backup any further: There is a lot of documentation already on our blog. So, let’s dive into the service providers possibilities. 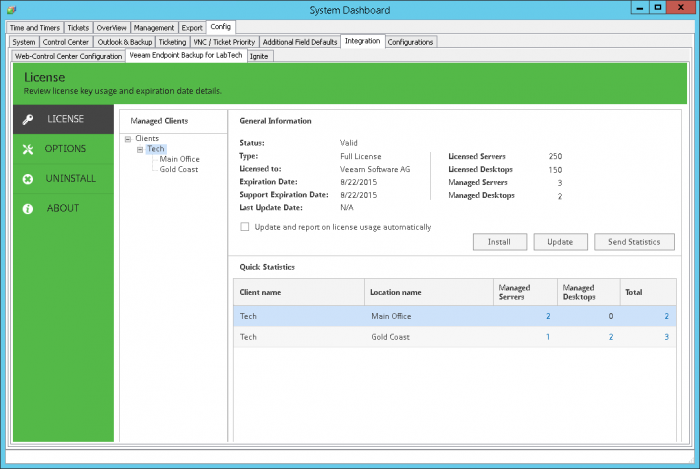 Administrators who have to maintain the endpoints with Veeam Endpoint Backup installed will have a system dashboard that gives them detailed information about licenses and managed clients — per client and per location. This is the place where you need to install a license key to be able to use the solution. Besides that, you will view information about your license, expiration date and support expiration date and more. In the Options tab, you will be able to specify the data retention period, and through the About tab, you will be able to download the logs for troubleshooting with support. Installing Veeam Endpoint Backup for end users is easy with this plug-in. You will be able to install the solution silently to any endpoint that has a LabTech agent installed. The moment it has been installed, it will become a fully managed Veeam Endpoint Backup client, ready to be managed and configured. It might be possible that some of those endpoints have already Veeam Endpoint Backup installed from before, or maybe it is part of a general OS image within companies. In that case, you can use a search query that will automatically identify and discover those machines, and by launching the activate script against those discovered endpoints, you can make them managed from that moment on. Both are done through scripts that can be found in the script menu. Besides those two scripts, we have additional ones such as collecting Veeam Endpoint Backup data, enabling and disabling read-only access mode, and more. From the moment an endpoint is activated or installed with Veeam Endpoint Backup client, you can start with the configuration and monitoring of the solution. You can configure the backup policy for one single endpoint or select multiple endpoints at the same time and do a mass-configuration, allowing you to do entire computer, select volumes and file-level backups using the same software! Specific Veeam Endpoint Backup monitors are provided out-of-the-box for service providers to quickly react at potential issues. For each monitor, you will be able to override parameters, customize the monitors and define the way the alerting is done, including to automatically creating tickets about the problem. In a service provider and RMM world, reporting is essential and we haven’t forgotten about that. Advanced reporting is included, and each report can be filtered on different criteria such as location, computer type, computer, group and client. We have five reports available: Endpoint Backup State Overview, Latest Endpoint Backup Job State, Protected Endpoints, Protected Endpoints Overview and, last but not least, License Usage. All these reports give you valuable information to make sure that everything is managed as it should be and can be billed on a monthly basis. An example of this is the Protected Endpoints Overview, which gives you (in a single view) the protected endpoints and, more importantly, the amount of unprotected endpoints. In our announcement blog, we already talked about the difficulties and costs that come with bare metal recovery. Visiting the client’s site to do a bare metal recovery of an endpoint can be time-consuming, resulting in loss of productivity for the end user and unnecessary on-site visits for the technician. 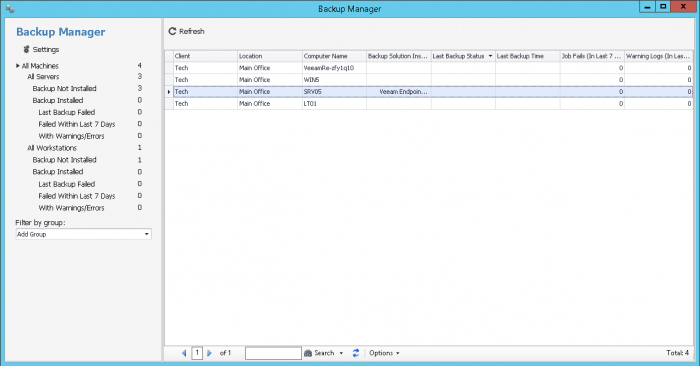 Veeam Endpoint Backup for LabTech allows you to perform remote bare metal recovery in a convenient and easy way. The end user only needs to start his or her computer with the created recovery media and after that, thanks to the enhancements in Veeam Endpoint Backup 1.1, a connection will automatically be established and the technician can take over the entire process. How we do this? When creating the recovery media, we make sure that we preserve the computer’s network settings and settings for the LabTech agent and apply those automatically to the recovery environment. This unique capability will dramatically reduce costs for the service provider because he or she doesn’t have to send a technician on site anymore, allowing more competitive service pricing and adds the value that support can be offered even when the end user is off site (for example, working from home or in a foreign country on a business trip). The end user will get better pricing as well as more support that is also faster, so it is a win-win situation for both of them. 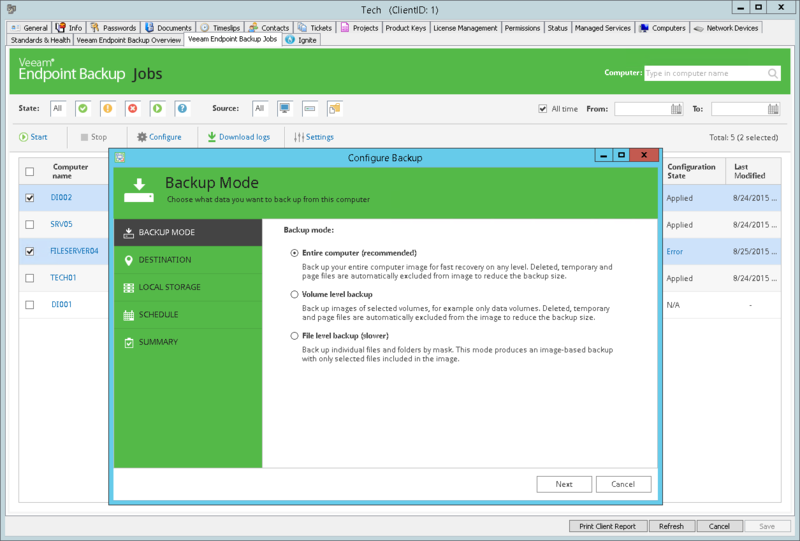 The Veeam Endpoint Backup Plug-in also integrates with the LabTech multi-vendor Backup Manager. The LabTech Backup Manager allows you to track the status for all managed endpoints and quickly identifies issues with Veeam Endpoint Backup jobs. 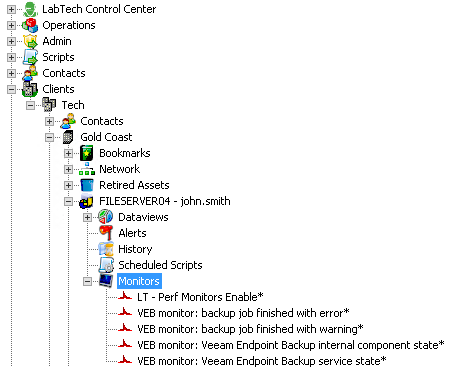 Veeam Endpoint Backup for LabTech provides centralized management for Veeam Endpoint Backup using the LabTech Control Center console and enables service providers to deploy, monitor and manage end-user endpoints remotely. Dataviews, reports and dashboards specifically designed for Veeam Endpoint Backup will make sure that service provider technicians have full control and visibility over the customer’s endpoints and that service providers will be able to offer more value and faster recovery times. In combination with Veeam Backup & Replication and the Veeam Backup & Replication Plug-in for LabTech, service providers will now be able to protect their customers’ virtual machines, endpoints and those last remaining physical servers, all with the solutions coming from Veeam Software! Customers will benefit from faster recovery times, additional services and a good night’s sleep knowing that their endpoints are protected and recoverable whenever necessary.